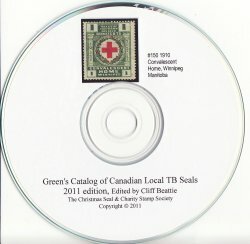 Green's Catalog, Canadian Local and Provincial TB Seals, 2011 ed. on CD. This catalog illustrates in color and prices Canada Local and Provincial TB Charity Seals, Sanatorium and Hospital Tax Receipts, and Anti-Smoking Seals and Stickers. Published by the Christmas Seal and Charity Seal Society (CS&CSS). Green's Catalog, Canadian Local and Provincial TB Seals, 2011 ed. on CD. This catalog illustrates in color and prices Canada Local and Provincial TB Charity Seals, Sanatorium and Hospital Tax Receipts, and Anti-Smoking Seals and Stickers. Published by the Christmas Seal and Charity Seal Society (CS&CSS). Full color, pdf files, 138 pages. This catalog is a great source of information regarding the Canadian local and provincial TB Charity Seals, including much historical information with photos regarding the various sanitoriums in Canada. Published by the Christmas Seal and Charity Stamp Society (CS&CSS). Print your own catalog. Requirements: MS Word and inkjet printer. Software is Non-Refundable and Non-Returnable. However we will replace a CD damaged in shipping.